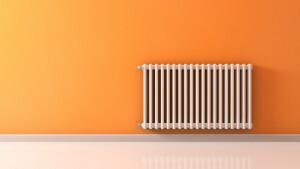 Radiators work by circulating steam through pipes to your radiator units. When the steam reaches a radiator, it releases its heat onto the fins of the radiator, which in turn heat the room. These fins hold heat even after steam is no longer circulating, which means the temperature in your house can continue to rise even after the system is shut off. So set your thermostat just a little lower than you usually would, and wait a while before deciding if your room is still too chilly. Although radiators get their name because they use radiant heating, they also rely on convection. What does that mean? Essentially, the temperature difference creates an air current that pulls in cool air for heating. For that reason, it’s important to make sure the space around your radiators is clear so air can circulate. If you’ve enclosed your radiator, make sure the enclosure includes a grate or screen that doesn’t impede air flow. Steam traps on radiators are a major factor when it comes to preventing steam loss. There are several types of steam traps, but all serve to let air and condensation escape from a system while maintaining steam pressure. They do wear out, so it’s important to regularly replace them. In an ideally maintained system, leaking traps will account for less than 5% of the total number of traps. How long should they last? That depends on how much your system gets used, but standard industry steam traps come with a year-long warranty and typically last between three and seven years. There are numerous brands available. Spirax steam traps, for example, are known for being particularly high in quality; although you may not need Spirax steam traps for an average home system, you should know that generic parts may not last as long. Old radiator systems may provide no way for you to control heat in individual rooms, leading to uneven heating. You can retrofit your system with thermostatic radiator valves, which self-regulate the amount of steam entering a radiator by sensing the surrounding air temperature. A boiler is an essential part of a steam radiator system, since it’s what turns cold water into steam (it takes 970 BTU, or 1,023,404 joules, of energy to convert each pound of water into steam at the same temperature). Many new boilers are simply far more efficient in that process than ones that are decades old. Are you looking for radiator valves or top-of-the-line Spirax steam traps? Let us know!